The EZLN accused the mainstream media of interviewing experts instead of truly investigating what happened during the San Juan Chamula massacre. The Zapatistas have slammed mainstream media over its coverage of the recent massacre in the Chiapas community of San Juan Chamula, accusing the “paid press” of focusing on the death of the town’s “corrupt” mayor while ignoring up to dozens of other victims of the bloody tragedy. Clashes erupted in San Juan Chamula July 23. Initial media coverage reported that Mayor Domingo Lopez Gonzalez, trade union leader Narciso Hernandez, and three others were murdered. But a report in the Mexican daily newspaper La Jornada, later indicated that at least 20 eople were fatally shot or hacked to death by machete in the violent outbreak. A photo appears here of Chamula’s main square after the massacre July 23, 2016. 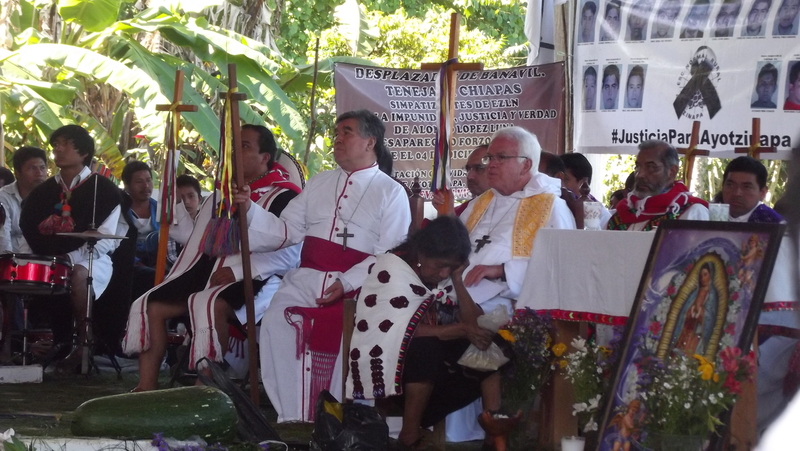 Moises also stressed that the Zapatistas regard see tragedies such as the massacre as the result of meddling by political parties, drug gangs, and the Catholic church. The Zapatista leader, embodying the “many selves” of the movement through the rank of Subcomandante, also highlighted how Indigenous communities have resisted for centuries in the face of systemic abuse, mistreatment, and insults that continues today when politicians “use” Indigenous people and call them dehumanizing names. Ahead of the San Juan Chamula massacre, the Zapatistas had warned in an open letter to the government of Chiapas of the risks of “playing with fire” in the community, referring to a campaign of repression against the dissident teachers’ movement. On July 20, paramilitaries allegedly from San Juan Chamula helped carry out a violent eviction of a teachers blockade in San Cristobal de Las Cases on July 20. Today we publicly denounce the actions that have been carried out against our Civil Society Organization Las Abejas de Acteal, by members of the group Consejo Pacifista Sembradores de Paz, led by José Patrocinio Hernández Gómez, spokesperson for the group, who is originally from the colonia Yashgemel, municipality of Chenalhó. Our Civil Society Organization Las Abejas de Acteal and the survivors of the massacre committed on 22nd December, 1997, agreed in our general assembly to denounce the action of the group Consejo Pacifista for doing nothing to help the peaceful struggle of our organization. The group Consejo Pacifista cover the actions they carry out by usurping the name, stamp, and logo of our organization. Currently they maintain a double discourse: in their public and written word, they speak of conciliation, of peace, and that they want dialogue, but their word is false because they act with threats and harassments. What they want is to appropriate and dispossess the physical and symbolic spaces of our organization in Acteal, House of Memory and Hope. For their purposes, they have allied with Ricardo Arturo Lagunes Gasca, who along with members of the Consejo Pacifista has betrayed the path of the people, because this adviser has deepened the division, and in turn acts like the bad government with its counterinsurgency and deceit, bringing lawsuits against us in federal court, thus eroding and deflecting the struggle because we are in pursuit of true justice, the Lekil Chapanel. The aim of the actions of the Consejo Pacifista is to be taken into account by other organizations, collectives, and solidarity movements, and to use that to confuse the brothers and sisters that have accompanied our resistance for Memory, Truth, And Justice, faced with the impunity of the Mexican State. From 28th October, 2014, those that currently form the group Consejo Pacifista ceased to be members of our Civil Society Organization Las Abejas, and since that date they have carried out violent actions against members of our organization and especially of our Board of Directors. Today we decided to speak so that the people, organizations, collectives, and movements are not confused. They have used the name of our Organization because they want to be recognized and so they can appropriate our headquarters of the Martyrs of Acteal. From the Tsotsil path and experience of our organization, we have had several meetings in order try to talk and dialogue with the brothers and sisters of Consejo Pacifista, however they have decided not to continue the dialogue. Currently, José Patrocinio Hernández is the voice of Consejo Pacifista and has been making denouncements, letters and invitations usurping the name, stamp and logo of our organization, making it look like he is a member of Las Abejas. Brothers and Sisters in solidarity with our Civil Society Organization Las Abejas de Acteal, we will not allow them to continue to use the name of our Organization. Furthermore, we do not want any more dialogue with them because already we have tried many times, since their words and actions do not give confidence and now the pathway of dialogue is ended. Today we tell the members of Consejo Pacifista that they cannot go into the headquarters of our organization, and carry out their meetings, conferences, make videos or take pictures, because they only use it to confuse people and make them believe that they are Abejas; by the agreement of members of the organization they must stop using the name, the stamp, and the logo of our Organization. We had not completely denounced these and other actions of the Consejo Pacifista, so we do it today, we the Civil Society Organization Las Abejas de Acteal; we did not say anything because we thought that they would reflect and recognize their mistakes. They have never taken account of their actions and provocations. We see that they have forgotten all the suffering resulting from what happened in 1997. We thank our compañeras and compañeros in solidarity, and the collectives, movements, organizations, the Indigenous National Congress, the national and international adherents to the Sixth Declaration of the Lacandon Jungle of the EZLN, the Pueblo Creyente, the Diocese of San Cristóbal, Frayba and especially Bishop Raúl Vera López, and everyone who from their heart has strengthened our path in search of Truth and Justice. We reaffirm that Acteal is the Site of Conscience for Humanity, is Sacred Land, place of Martyrs, House of Memory and Hope. 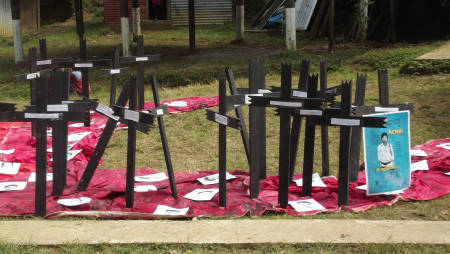 On 22 December 2015, 18 years since the massacre of 45 indigenous persons in Acteal, Chenalhó municipality, the Las Abejas Civil Society (organization to which the victims had pertained) carried out a pilgrimage and a commemoration of the events to denounce the impunity that continues to prevail in the case. Eighteen years ago, gunmen crept down into the centre of the impoverished village of Acteal and killed 45 innocent people including 21 women and 15 children. Hundreds of indigenous people held a demonstration Wednesday in the small village of Acteal in the southern Mexican state of Chiapas, to mark the 18th anniversary of the slaughter of 45 people including pregnant women and children. Demonstrators belonging to the peaceful group of “Las Abejas” (The Bees) decried the killing, labelling it a “state-sanctioned crime” and calling out authorities for the impunity marking the case. “This state-sanctioned crime remains unpunished and the government does not investigate the intellectual authors … the Supreme Court ordered the mass release of the paramilitaries who killed our people, only two remain jailed,” the group said in a statement released to La Jornada. On Dec. 22, 1997 gunmen crept down into the centre of the impoverished village of Acteal and killed 45 innocent people, including 21 women and 15 children who were attending a mass service. The case generated international outrage after prosecutors found that local authorities allowed the slaughter to occur and tampered with the crime scene afterward. Former President Ernesto Zedillo claimed the massacre was triggered over a land dispute between residents of two separate ethnic communities. However, the survivors and relatives of those killed claim that the attack was politically motivated and an act of state-sponsored terror. 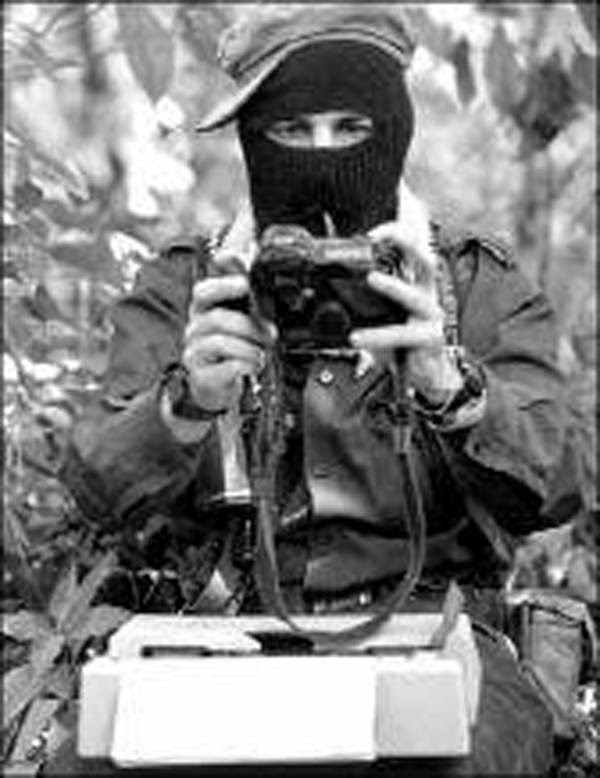 According to activists and survivors of the attack, government officials provided both weapons and training to a paramilitary group known as the “Red Mask” in an effort to wipe out the leftist Zapatista Army of National Liberation, which played a major role during the 1990’s in the indigenous communities of Chiapas. According to independent investigations conducted by humanitarian organizations, the Acteal massacre was part of a counterinsurgency plan implemented during the government of Zedillo, who was sued in 2009 by the victims’ relatives in a U.S. court. However, Zedillo has not faced any charges due to the immunity provided to him by the Mexican government. Hundreds of people have been arrested since 1997 but only a few have been sentenced. 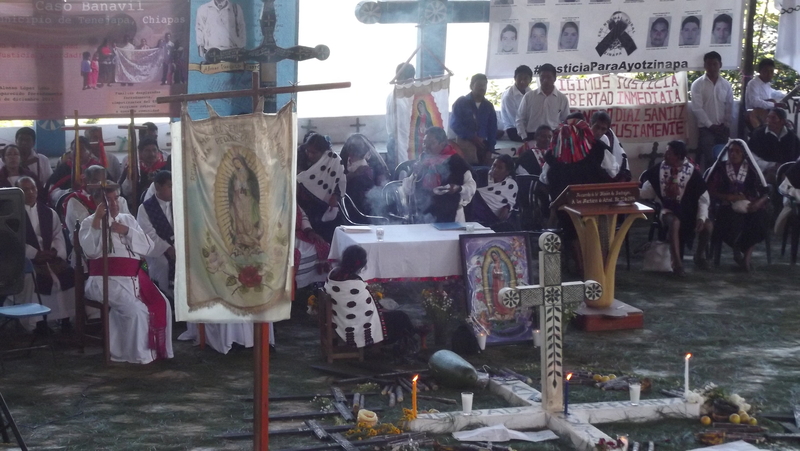 In the chapel of Acteal, in the municipality of Chenalhó, Chiapas, there were at least 16 children, 20 women, 7 of whom were pregnant, and 9 men praying, when a group of paramilitaries entered, shooting, and killed 45 of those people. It was December 22, 1997 and the massacre lasted about seven hours. “For 18 years no justice has been done and the wall of impunity persists, but the Civil Society Las Abejas is building, through its forums, the other justice,” Pedro Faro Navarro, director of the Centre for Rights Human Fray Bartolome de las Casas (FrayBa) told La Jornada. At one time, about 100 people, all of them indigenous, were detained in prison in Tuxtla Gutierrez accused of the massacre. Among them were eight former public safety officers sentenced to three years and then released. In 2007, ten years after the events, 18 people were convicted for possession of firearms. Between 2009 and 2012 all the detainees were released. Mostly because the Supreme Court invalidated the evidence with which the PGR put together the case. In 2005, FrayBa and the civil organization Las Abejas, to which the murdered Tzotzil indigenous belonged, filed the case with the Inter-American Court of Human Rights attributing responsibility for the massacre to the Mexican State. 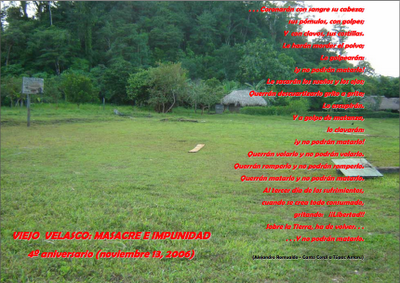 Communiqué from the CCRI-CG of the EZLN following the Acteal Massacre, released 23rd December 1997. FIRST.- According to information compiled until today, about 60 paramilitaries of the institutional revolutionary party (sponsored by the federal and state governments) were the ones who attacked the indigenous with high caliber weapons. Among them were refugees of Acteal. SECOND.- As a result of this attack which lasted up to four hours, at least 45 indigenous people were assassinated, among them 9 men, 21 women and 15 children (one of them an infant less than a year old). In addition to the dead the wounded counted among them 7 men (4 children) and 10 women (4 of them are little girls). Acteal. THIRD.- According to radio transmissions of the government of Chiapas (intercepted by the EZLN) in the immediate surrounding of Acteal at the time at which the massacre was being carried out, public security police of the state of Chiapas backed up the attack and during the afternoon and evening dedicated themselves to picking up cadavers in order to hide the magnitude of the massacre. Misters Homero Tovilla Cristinani and Uriel Jarquin (Secretary and Subsecretary of the government of Chiapas respectively) commissioned the police to back up this crime. Mister Julio Cesar Ruiz Ferro was constantly informed of the development of the “operation” (at least since noon of the 22nd day of December, when the massacre was an hour old). Approved by the federal and state government, the attack was fine-tuned on the 21st of December in a meeting of paramilitaries (led by Mister Jacinto Arias, PRI municipal president) of the communities of Los Chorros, Puebla, Esperanza and Quextic, all of them municipalities of Chenalho. FOURTH.- The direct responsibility for these bloody events fall upon Ernesto Zedillo Ponce de Leon and the Justice Ministry, who, two days ago, gave a green light to the counterinsurgency project presented by the Federal Army. The aim of this project is to displace the Zapatista war and make it appear to be a war among the indigenous, motivated by religious, political and ethnic differences. In order to carry this out, they have dedicated themselves to financing equipment and weaponry (through funds of the Social Development Ministry) and giving military training (led by officials of the federal army) to the indigenous recruited by the Revolutionary Institutional Party [PRI]. In order to allow time for these death squads to get ready, the Mexican Federal Government designed a parallel strategy of simulated dialogue, which consists of carrying out negotiations without any intention of carrying out what had already been agreed to, and by increasing military presence in Zapatista zones. The government of the state of Chiapas was put in charge of guaranteeing the impunity of paramilitary groups and facilitating their operation in the principal rebel zones of the North, the jungle and the highlands of Chiapas. SIXTH.- As part of the style of government and demonstration of his “will for peace” through diverse channels, Mister Ernesto Zedillo Ponce de Leon has sent threats to the general command of the EZLN with the following message “I prefer to go into history as a repressor before implementing the agreements with the EZLN”. He has carried out his word. Zedillo has gone into history as an assassin of the indigenous and has the blood of Acteal on his hands. SEVENTH.- The prompt attention of the media in Chiapas and the just indignation of national and international public opinion in response to these events, has made the mastermind of the crime scramble to the forefront in order to wash their hands of it and promise “in-depth” investigations. They will not punish those who are responsible, impunity is guaranteed because those who investigate the crime are the same ones who planned it. For these reasons, the declarations of Mister Zedillo and his subordinates are nothing more than demagogy. EIGHTH.- Using the motive of the massacre of Acteal, the government and its spokespeople call once again to dialogue without mentioning the fact they have no intention of fulfilling any agreements but rather advancing their counterinsurgency strategy. In this sense, the recent and ridiculous declaration of the COCOPA (which decided to go on vacation instead of working for peace) in regards to Acteal. The legislators forget that it is the government which is assassinating children, women and men, that it is the government which is using weapons, that it is the government which refuses a serious dialogue. It is to the government that they should direct themselves when they talk about not resorting to violence, and about the necessity of dialogue. NINTH.- Once again the EZLN calls upon national and international civil society and upon independent organizations to not be deceived, to demand true justice and not pretensions. TENTH.- The Indigenous Revolutionary Clandestine Committee, General Command of the EZLN is at these moments completing its investigation and analyzing what has occurred in order to make the pertinent necessary decisions. 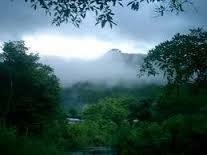 On 13 November 2006, at 6am, in the community of Viejo Velasco, Ocosingo, Chiapas, adjacent to the Montes Azules Biosphere Reserve in the Lacandon Jungle, a group of 40 persons from the New Palestine community, accompanied by 300 units from the sectorial police, invaded the community and attacked its indigenous Tseltal, Tsotsil, and Ch’ol residents, leaving four dead, four others disappeared, and 20 men, 8 women, and 8 children forcibly displaced, being survivors of the assault. San Cristobal de las Casas. August 12. 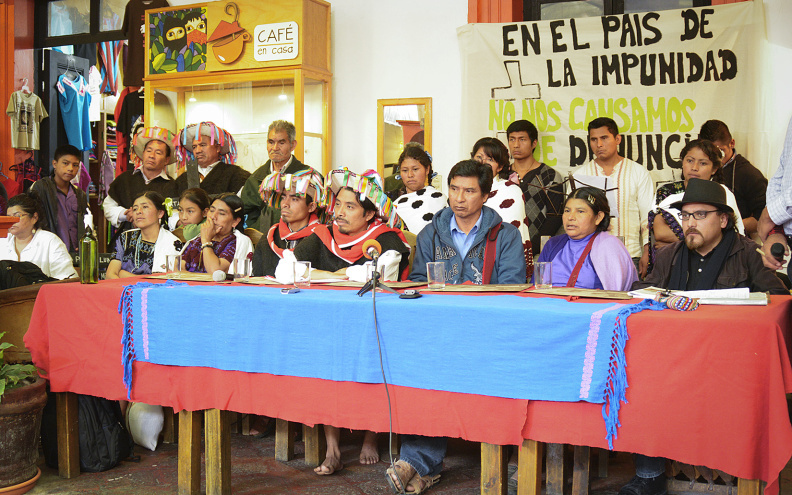 “The justice system of the bad government, is working in the same way as it worked both during the events prior to the Acteal massacre, and at the time of the massacre” said authorities of the organization Las Abejas of Acteal in a press conference; they said this because the Special Prosecutor for Indigenous Justice, based in San Cristobal de Las Casas, has failed to investigate those responsible for the murder of their compañero Manuel López Pérez, ambushed on 23rd June last, near the municipal seat of Pantelhó. The organisation, which is also a member of the Indigenous National Congress, warned that the family of their slain compañero Manuel López, “are in danger of losing their lives, because the murderers are loose.” Relatives of Manuel are displaced and have been living in a community of Las Abejas of Acteal, since 26 June 2015. They are four people who left their homes and lands and do not know when they can return to their community, “because the bad government does not have the political will to put a stop to the attacks,” they denounced. According to investigations made by the Fray Bartolome de las Casas Human Rights Centre (Frayba), the actions of the commander of the Municipal Police of Pantelhó and the Judge of Peace and Reconciliation in this municipality Pedro Girón López, “are complicit with this failure to investigate, giving, as a consequence, protection to the armed group in the region.” The modus operandi of the authorities “puts at risk the family of Manuel and members of Las Abejas and its Board of Directors,” they said. 17 years after the Acteal massacre, the Las Abejas Civil Society organized a series of activities held in this same community. On 21 December, a forum combined testimonies with prayers. During this event participated Franciscan monks from the “72” migrant-home from Tenosique, Tabasco; the relatives of the disappeared students of the Normal Rural School of Ayotzinapa, Guerrero; the father of Alejandro Díaz Santis, prisoner in the San Cristóbal jail and a member in solidarity with the Voz del Amate; the catechist Margarita Martínez Álvarez from El Limar, Tila municipality, in the northern zone of Chiapas, a region that also suffered murders, forcible disappearances, and massive displacements between 1995 and 2000; as well as representatives of the displaced from Banavil, Tenejapa municipality. It was stressed that all these processes should be united, not just based on shared pain, but also in terms of the search for justice and hope. On 22 December, following a pilgrimage, a mass was celebrated with the presence of hundreds of persons. The Las Abejas Civil Society denounced in a communique that “17 years, four presidents, and two political parties in power have passed since the bad government of Ernesto Zedillo to the [present] bad government of Enrique Peña Nieto. Not one has had the dignity, humanity, or decency to apply justice and recognize the truth of the Acteal massacre.” The bishop Felipe Arizmendi stressed for his part that “it is unconscionable that nearly all those imprisoned for this crime have been absolved, just because there were judicial deficiencies in their legal processing, not because they were innocent.” It should be recalled that only two persons remain imprisoned for the crime of the Acteal massacre, and these two have had their sentences reduced from 36 to 18 years imprisonment. There have been seven years of state neglect. The investigations carried out have not been effective in clarifying the facts, determining responsibility or punishing the perpetrators and masterminds of the massacre, who are identified by law enforcement authorities. It is important to remember that on November 13th, 2006, about 40 people dressed in civilian clothes, from the community of Nueva Palestina, municipality of Ocosingo, accompanied by approximately 300 members of the then Sectorial Police and carrying firearms, physically attacked indigenous Tzeltales, Tzotziles and Choles, who were living in the community of Viejo Velasco, Ocosingo. The result of the attack was seven people dead, two missing, and the forced displacement of 20 men, eight women, five boys and three girls. In addition, Petrona Núñez González, survivor of this massacre, died in 2010 as a result of the post-traumatic stress she was experiencing. Seven years after these events, human rights violations continue, since the 36 people who fled on the day of the massacre remain forcibly displaced from their home community, living in different municipalities of Chiapas, in difficult economic and social conditions; a situation which does not allow them an adequate level of life in their physical or mental health, in a state of vulnerability, and having a continuous violation of their rights as set out in the Guiding Principles on Internal Displacement of the United Nations. Mariano Pérez Guzmán and Juan Antonio Peñate López are still missing and police investigations have come to a halt, due to a lack of interest from the Prosecutor General of Justice of the State of Chiapas (PGJE) in their whereabouts. Families of the disappeared continue in their search for truth and justice. Meanwhile, Chiapas state authorities still have not arrested any of those responsible for this paramilitary-type action. According to the same PGJE investigations, the responsibility lies with members of the Organization for the Defence of Indigenous and Campesino Rights (OPDDIC) from the community of Nueva Palestina, Ocosingo and with members of the then Sectorial Police of the state of Chiapas. On the other hand, the PGJE continue with judicial harassment against the residents of the community of Nuevo Tila, neighbour to the community of Viejo Velasco, who were the first to bring aid to the wounded, receive the displaced people and give support in the search for the disappeared. The organisations signing make clear that crimes against humanity must not go unpunished. It is necessary to know the whereabouts of Mariano Pérez Guzmán and Juan Antonio Peñate López, to clarify the events of November 13, 2006, to find and punish those responsible, to take measure against repetition, to repair the damage and to stop criminalizing the people of Nuevo Tila. The right to justice, as indicated by the Inter-American Court of Human Rights in the case Ituango against Colombia, is understood as the right of the victims, the survivors and their families, within a reasonable time, to have all that is necessary done in order to know the truth of what happened and to punish those responsible. Family members and society have the right to know the truth of what happened, and the reasons and circumstances in which the human rights violations were committed. Faced with the deliberate apathy of the state authorities, and as a way to fight against impunity, the act of the Massacre of Viejo Velasco is to be presented before the Permanent Peoples’ Tribunal (PPT) in the session on the Dirty War and the session on Migration, Refuge and Forced Displacement, which next month will hold a pre-hearing in the North of Chiapas, where testimonies of victims and survivors will be planted in the tree of life, truth and justice, surrounded by the tireless struggle for their rights, and against impunity and forgetting. Centro de Derechos Humanos Fray Bartolomé de Las Casas A.C . – Frayba.